My wife Pat and I started Hawke Originals In 1992 when we moved to Nova Scotia, after fifteen years of 9 to 5 in Bermuda. We fell in love with this area on a vacation here a couple of years before. The people, scenery, extensive craft network, rock hounding, and much more seemed to draw us here. To date we have not had any regrets. 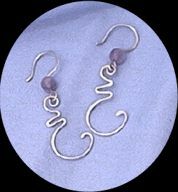 I have been a hobbyist jeweler since the mid seventies and working at it full time since 1992. I generally handle the design and fabrication of the pieces. Each piece is individually hand crafted, we do not mass produce by casting. We are happy to accept custom orders for one-of-a-kind pieces and will work with individual customers by fax or E-mail. We now have numerous satisfied customers worldwide. Our custom and one-of-a-kind pieces are usually designed around unique stones, hand cut and polished by Pat. She also handles all of the day to day operations of our business. I am currently a juried member of The Nova Scotia Designer Crafts Council , member and past president of the Metal Arts Guild of Nova Scotia, and a member of the Canadian Federation of Independent Business. I recently spent a year training four First Nations apprentice silversmiths from the Horton Reserve near our home. One of whom has made me proud and gone on to start her own successful business, ' Mi'kmaq Silver Jewelry'. Mindy Gallant-Zwicker's work can be purchased at the Atlantic Craft Trade Show and in select shops in Nova Scotia. Inspiration for my designs comes from the natural world that surrounds us so abundantly here in Nova Scotia, as it did in my homeland (Bermuda). The best description of my style of design came from a customer, who described my work as "a minimalist fusion of Celtic and Art Nouveau". A tad pretentious but that just about sums it up. We have been retailing and wholesaling our jewellery for almost ten years now, here in the Maritimes, and the consistent positive reactions to our work have prompted us to seek a wider audience. Thank you for taking the time to have a look at this site.